However, gaps in necessary technology and practical uncertainties beyond the cars' promising physics mean that they may not arrive in time to be a large-scale solution to the energy crisis and congestion – if at all. It might at first seem crazy that a flying car could be more efficient than a road car, especially when conventional planes have such a reputation as gas guzzlers. But flying isn't inherently inefficient – after all, birds can fly between continents without eating. Of course, a small, four-passenger car isn't an albatross, but it isn't a Boeing 737 either. There are many ways to make a car fly, but most are too problematic to get off the ground. Perhaps the most promising option is that taken in this study, based on the physics of vertical take-off and landing (VTOL) aircraft. They're pretty amazing beasts. If you've heard of VTOL, something like a Harrier Jump Jet probably springs to mind, with two huge engines directing thrust that can be tilted vertically or horizontally. But these much smaller and lighter flying cars operate differently, with lots of tiny electric fans blowing air from many places. This fast-developing distributed electric propulsion (DEP) technology is key for efficiency when cruising, and it also creates possibilities for quieter take-off and hovering, as multiple small noise sources can be better managed. Wing and propeller design can also be optimised to be long, thin, and have lots of moving surfaces, just as birds do to make their flying efficient. The aim of all of these technical enhancements is to achieve maximum lift for minimum drag – the force that opposes an object's motion through air and slows it down. A better lift-to-drag ratio means lower power consumption, and therefore lower emissions. These energy-saving innovations make cruising a breeze – but they don't help much with take-off, hovering, or landing, which are still inherently inefficient. So while VTOL flying vehicles are still viable for short intra-city travel and pizza deliveries, they will not solve the energy crisis. For 100km journeys, electric flying vehicles could be 35% more efficient than a petrol-powered car – although, assuming the same number of passengers, still less efficient than an electric road car. However, it's fair to assume that flying cars will serve primarily as taxi services in pre-defined air corridors, and are therefore likely to consistently carry more people. Taking this into account, for a 100km journey flying car emissions could be 6% less than those of electric road cars. As journey distance increases, so too do the efficiency gains over stop-start road cars, which have to deal with rolling resistance and less efficient airflow. But unfortunately, range is the Achilles heel for electric aviation. 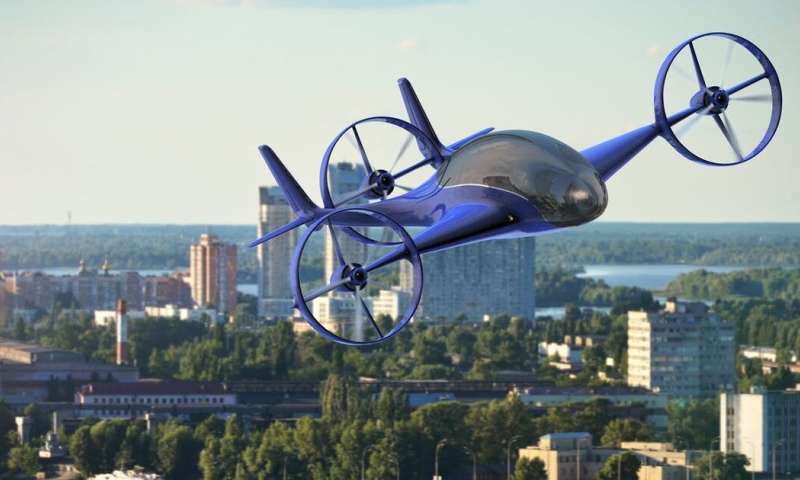 The study looks at a range of up to about 200km and here flying cars could perform well. But while jet-fuelled planes can lose as much as 70% of their weight during flight (albeit at a cost of 100kg of CO₂ per passenger per hour), batteries don't get lighter as they discharge. This means that beyond 200km or so, carrying batteries becomes a distinct disadvantage. The accepted view is that electric planes will only ever be viable for short-haul flights. It's energy density that matters, measured in watt-hours per kilogram. Right now, the best batteries provide around 250 W-h/kg, a mere shadow of jet fuel and gasoline's 12,000 W-h/kg. Batteries could creep up to 800 W-h/kg by the middle of this century, increasing their feasible range to 700 miles – half of all global flights fall within this distance. But without more dramatic innovation in battery technology, biofuels and liquid fuel from air-capture of CO₂ will likely need to play a substantial role in long-haul air travel. Aircraft also have highly stringent criteria for maintenance and downtime, which can often offset gains in performance and emissions. As an entirely new breed of planes, it's impossible to predict how much it might cost to keep them air-worthy. Unforeseen maintenance complications can cost billions – just ask Boeing. So when it comes down to CO₂ emissions per passenger kilometre, at present these advanced DEP flying cars are at best comparable to their road-going electric equivalents, and, at worst, little better than conventional combustion cars. With technology and safety improvements, they could yet play a part in our fossil-fuel-free future, taking short-haul planes out of our skies and freeing up fume-filled roads. The question on everyones' lips is whether these flying cars will be ready in time to make a jot of difference to our very pressing energy crisis. Can we wait 30 years? "It might at first seem crazy that a flying car could be more efficient than a road car, especially when conventional planes have such a reputation as gas guzzlers." Yeah, energy spent to keep it aloft plus energy to move laterally will be greater than energy to move laterally on the ground. And then there's little mention regarding generating that electricity, except "of course, a grid powered by low-carbon sources is essential to make battery-powered vehicles part of the solution to our climate crisis." Maybe they should work on "a grid powered by low-carbon sources" problem first if emissions reduction is the goal. The battery problem, the noise problem, the fully automated flight and traffic control system problem, the cost of sufficient safety problem. I think it will be a good deal longer than 30 years. I don't think there's a battery problem. Commutes (and then some) are well within range of battery powered aerial vehicles. Autonomous (and safe) pathing for aerial vehicles is trivial. Most certainly these will NOT be "fly-by-sight" kind of vehicles. ..and then only use rotors for the VTOL part, I see no way how this could be brought down to acceptable noise levels.